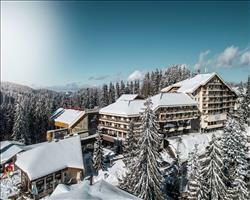 The ultimate guide to Pamporovo ski holidays in 2019 & 2020. 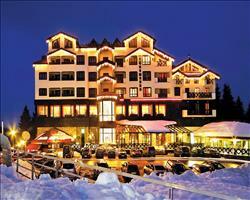 Nestled in pine forests in the Rhodopi mountain range, you’ll find Europe’s sunniest ski resort. This beautiful Bulgarian village is compact and well hidden, meaning you won’t have to fight your way through the crowds to get a seat on the efficient lift system. The village is nestled comfortably at the base of the Snejanka peak, which translates to Snow White, an understandable name given the magical pine forests and enchanting log chalets you’ll find here. 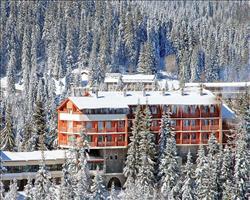 There are a variety of perfectly groomed pistes, most of which converge at the resort’s impressive Snezhanka Tower. Head up to the observation deck and take in the views, before picking out perfect piste and cruising back down to the charming village. If you can drag yourself away from the great skiing and glorious Bulgarian cuisine, there are some highly commendable traditional Rhodopi homes in the surrounding villages to help you get to know Pamporovo just that little bit better and nearby towns Plovdiv and Smolyan are well worth a visit. The resort is a 4 hour transfer from the bustling Bulgarian capital Sofia, or 2 hours from Plovdiv airport, but the lengthy transfer is a small price to pay the seclusion and breathtaking views you’ll get here. Speaking of small prices, one of the main attractions of Bulgarian ski resorts is the money you’ll save in comparison to a similar holiday in France or Switzerland. Pamporovo’s price tag doesn’t disappoint, with affordable luxury in terms of accommodation, the ‘Pamporovo Full ski Pack’ pass at £146 (adult, 6 days), and unbelievably cheap food and drinks, on and off the slopes. Needless to say you’ll save a heap on a ski trip here, perfect if you’re on a budget, or if you want a little more to spend on that all-important fluorescent onesie you’ve been eyeing up. View our detailed Pamporovo snow forecast or snow report and see all live webcams, piste maps, road and travel maps and lift pass prices. For a picture of historic snow conditions see the snow depths month by month with our Pamporovo snow history. 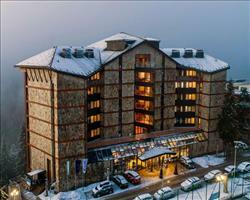 If you’re new to the snow, this is the perfect place to discover your love for skiing. The safe hands of Pamporovo PLC school will ensure you and any other beginners not only learn a ton, but have a great time doing so. The school meets in the Malina region, a short few minutes on the bus from the centre where you’ll get to grips with your French fries and pizza slices - you’ll be cruising down the magnificent Snezhanka 6 ‘Touristic’ piste in no time. For intermediate skiers, the slopes offer a wide range in difficulty, from the Snezhanka 10 for recently ‘promoted’ beginners, to the long return on the ‘Malina’ slope (number 4 on the piste map) for those who need a little more time before giving the black slopes a go. 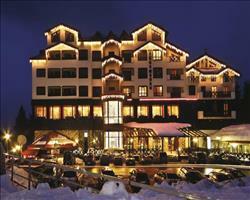 Experts are in for a real treat in the form of the resort’s most exciting and challenging slope, ‘The Wall’. Complete with a mogul field and floodlights for a spot of night skiing, this short-but-sweet slope should keep advanced skiers well entertained. The majority of the fantastic slopes begin from the Snezhanka Tower (Pamporovo’s take on our BT Tower, if you will), and stem down through pine forests, giving you an equally impressive view whatever piste you’re cruising down. There may be a few draglifts around in the resort, but snowboarders will forget any T-bar shaped problems when they arrive at the Pamporovo Funpark just off the ‘Ladies track’, also known as the Snezhanka number 10. The park is kitted out with kickers, table tops, pipes, King rails, and plenty more things to entice any boarders or ski tricksters out there! 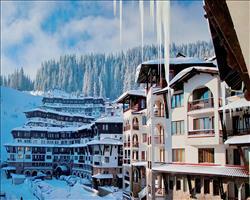 At first glance, the dreamy pine forests and cosy-looking chalets may give you the impression of a sleepy resort. It was also once advised to never judge a ski resort’s après ski by its cover (well, something like that), and we’d recommend the same for ‘Pamps’. 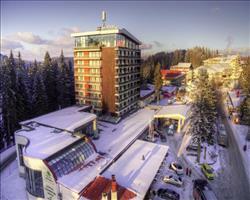 Aside of course from the great skiing on offer here, there are also bowling and fitness facilities, or if you can manage a longer break from the slopes, day trips to Plovdiv or visits to traditional Rhodopi homes in surrounding villages are well worth a go. However the homely the Rhodopi villages may be, we regret to inform you you’ll have to leave at some point. 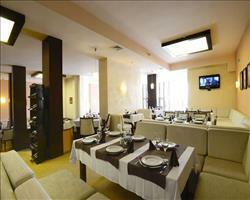 When this fateful day comes, rest assured you’ll be equally well looked after in some of Pamporovo’s fantastic restaurants. The White Hart is a firm favourite, cooking up anything from simple comfort food after a long tiring day on the slopes to fine steaks. 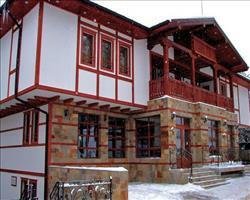 Alternatively, the Chevermeto is the resort’s oldest restaurant and is perfect if you’ve acquired a taste for Bulgarian cuisine. After this we’re sure you’ll need a drink or three to wash down all the great food, and the village has plenty of fitting watering holes. The pub-style White Hart itself transforms on Thursday into a lively karaoke bar, full to the brim with cheap local beers, making belting out those classics just that little bit easier. If this is just the start of the night for you, head down to Dak’s Irish bar, where dancing late into the night, on and off the tables, is order of the day, or try out the similarly wild Night Flight club. Hangovers? We promise a day of crisp Bulgarian mountain air and skiing will do the trick, (for the record, not a money-back guarantee!). 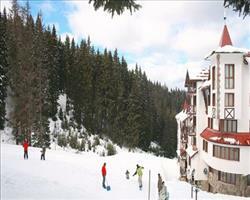 When is the best time to ski Pamporovo? As beautiful as Pamporovo is all year round, we find skiing is best done on some nice fluffy white snow, of which you’ll find plenty here in Pamporovo from December til April. As you can see from our handy Pamporovo snow history page, ‘Pamps’ gets its deepest snow around February, but snow cannons here and North-facing shady slopes, help preserve the snow through the whole ski season. If you don’t fancy dwelling on the past, have a look at our snow report and snow forecast, for an idea of what the conditions are like right now and what you can expect in the near future. There are lots of family friendly ski resorts out there with gentle slopes, great learning facilities and a wealth of accommodation choices. 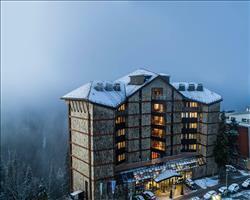 Pamporovo is no different, except for one big (well, actually small) factor - the price. 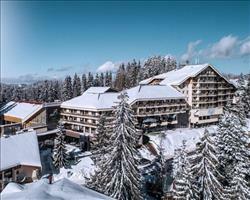 As with many of the Bulgarian ski resorts, you’ll pay a fraction of the price you would in a similar French or Swiss resort, making the idea of treating the clan to a ski break even more tempting. For beginners young and old, the PLC ski school should have you cruising down the Touristic piste in no time… maybe even the Snezhanka 10 by the end of the week if you’re feeling brave enough. If there are any daredevil teens coming along, they’ll love the prospect of the kickers, pipes and rails all found at the Pamporovo Funpark (just off the Snezhanka 10 piste). When it comes to off-the-slope activities, there are bowling and fitness facilities, day trips to Plovdiv or traditional Rhodopi villages, not to mention the incredible views from the Snezhanka Tower – a great spot for a family photo. Needless to say, you’ll all need some good grub and a comfy pillow to rest your head on after a day full of activities. Get a taste of Bulgarian cuisine at the Chevermeto or some hearty pub food at The White Dog, before cosying up in one of many family-friendly hotels or heading back to your apartment. Wherever you have your heart set on, you’ll get the best value for money by booking our package with the big 3 - flights, transfers and accommodation, however our deals for self-drive or independent travel are also worth getting in touch for! Having mostly beginner and intermediate slopes, this is a super place for groups with children or those who haven’t skied before - beginners will love the gentle scenic route on Snezhanka 6 ‘Touristic’ piste. Experts don’t have a huge amount of terrain but ‘the Wall’s’ short-but-sweet mogul run is well worth a ski. Budding freestylers can sharpen up their skills in the Pamporovo Funpark and should any non-skiers be able to resist the temptation to take to the snow, the homely surrounding Rhodopi villages are well worth a visit. "Recommended for blue skies and sunshine!!!" 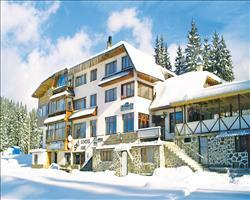 4th group trip in Pamporovo and we will be back! I’ve skied all over in Chamonix and other places and for me to be thinking of going back to Pamporovo for the 5th time is unheard of. We were a group of 10 this year and everybody on the holiday loved it! The snow wasn’t as good this year (last year there was so much snow that the power went!) but they had the cannons going. It’s quite a small resort but there are still things that you can do like torchlight walks, sledding, hot springs, some of the girls have massages, and there are some nice bars there. It is so cheap and such good value – I went away with £350 spending money and came back with £180, and I didn’t scrimp on lunches etc. The ski area is fantastic for beginners and intermediates, if you just want to get your confidence up there are some lovely cruisey blues and reds. If you were an expert, top notch skier wanting to get up early and ski loads of black runs all day, there isn’t much apart from a bit of off-piste and a few black runs. The transfer takes 3-4 hours but stops on the way, and one of our highlights is stopping for a McDonalds every year! You get a lot of sunshine and lovely blue skies. The slopes are lined with pine trees and it’s so pretty. The locals make sure you have a good time in the bars. The ski instructors are fabulous, they don’t rush you and make sure you enjoy yourself. You might look and think some things are a bit tired and the chair lift needs a lick of paint etc, but it’s cheap and cheerful and just a lovely place that has all we need. March is a great time to go for snow and sun, but go after the Bulgarian bank holiday because that weekend is very busy, it takes an hour to get on the lifts etc. It’s quieter after the weekend but the next week is best. I don’t have much to compare Pamporovo to but I thought it was better than the skiing in Livigno. It’s good for learning. The actual ski runs here are quite long and the beginner slopes are good. There are some nice runs which carve down through the forest. We are all snowboarders and we didn’t find it very snowboarder friendly. The skiers don’t cut the snowboarders much slack, they don’t treat them with much courtesy. For example my lad fell over and I told him to wait a moment and catch his breath. While he was sitting there this ski instructor came by with a group and almost skied into him, I’ve never seen anything like that at other resorts. The town itself is not lively, but it’s fine if you don’t want to go out a lot. "Perfect for beginners and families"
The resort itself always has plenty going on with most reps running entertainment in the evenings. The skiing is more inclined for beginners and intermediates, there are a couple of black runs but they’re quite short ones (the one called ‘the wall’ is probably the steepest). My only criticism is that the transfer time is a good couple of hours. Some packages offer you the option to go into Sofia on the way back to the airport, which I try to avoid now. You have to pay for it when you’ve already paid for the transfer anyway. The rep just shows you a couple of old buildings then leaves you to find yourself lunch and Sofia is always so busy at lunch time. "Not much to do if you don't ski"
We found Pamporovo a bit quiet, we didn’t ski and didn’t manage to find much to do apart from relax in the hotel, pop out for lunch and wander around the village. I wouldn’t recommend it to other non-skiers, you really need to be skiing to enjoy it here unless you’re happy sitting around all week. We had the kind of weather you’d want in the mountains which was good and our journeys to and from the resort were fine, it’s quite a long transfer of 3-4 hours but we knew that before we went. 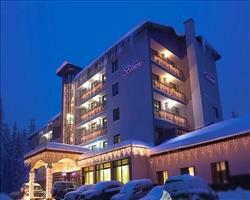 "First class artificial snow making"